What’s in a name? Well quite a lot really. The Stop Climate Chaos Scotland (SCCS) coalition put a lot of thought into what to call the march on 28th November. It has to reflect a lot of things, it has to be a call to action; it has to show we are marching for a serious cause, but also that it is a family friendly event. SCCS is a diverse coalition of organisations in Scotland campaigning together on climate change. Our members include environment, faith and international development organisations, trade and student unions and community groups such as Scottish Communities Climate Action Network. Pulling together and reaching out beyond our usual ‘allies’ we hope to have a great day and help build the climate movement in Scotland. Scotland’s Climate March is part of a worldwide movement: over that weekend in November hundreds of thousands of people across the globe will take to the streets to call for strong and urgent action on climate change – showing their commitment to creating a low carbon world. This is all in the build up to the UN climate negotiations in Paris at the end of the year, where global leaders will conclude negotiations for a new international deal to tackle climate change and address its impacts. But of course it is about much more than what is agreed to in a conference hall in Paris. Scots need to ‘show your colours’ for two reasons. Firstly the march will be bright, fun and colourful to help build a family-friendly and inclusive experience – so wear your brightest clothes! There will be many people who have been to marches before, but to build the movement it has to be a positive first experience for many who have never taken to the streets before. Secondly of course we are asking for Scotland to show its commitment to transitioning to a low carbon society. Scotland needs to show its colours in terms of ambition and dedication – both here and in Paris. Scotland’s Climate March is an opportunity celebrate the great work that communities across the world, including here in Scotland through networks like Scottish Communities CAN, have already been undertaking to transition to a low carbon lifestyle. I hope that everyone on the march gets the opportunity to become inspired by the work of Scottish Communities CAN’s members and can take those ideas back to their own communities. The conference in Paris is an important step, and it is right that we focus our energies and combine efforts across our broad coalition to pile on the political pressure for as strong a deal as possible. Scotland has a good and ambitious story to tell in the international context in terms of commitment to climate action, but we must maintain this pressure on politicians back here in Scotland beyond Paris. For example we need to do a lot more work in transport and heating policy. The climate movement learnt some tough lessons in 2009 when the COP was in Copenhagen – we had a tremendous build up, but were ultimately let down. This led years of inaction and focusing on other priorities. So as the talks in Paris approach must be looking for the next opportunity to take the movement on. Fortunately here in Scotland we have the Scottish elections in 2016. SCCS will push for all of Scotland’s political parties to publish manifestos which enable Scotland to deliver on its climate commitments. To abate climate change, we have to work together in the build up to Paris, and far beyond. Let’s use this march to talk to people and show them our colours, and the positives of moving to a low carbon lifestyle. 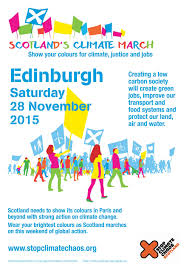 So come along to the march on the 28th of November in Edinburgh and show your colours – in both senses!